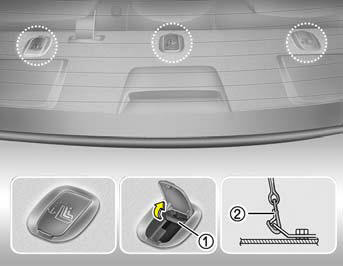 Three child restraint hook holders are located on the rear seat package tray. 1. Open the tether anchor cover on the rear seat package tray. 2. Route the child restraint seat tether strap over the seatback. For vehicles with adjustable headrests, route the tether strap under the headrest and between the headrest posts, otherwise route the tether strap over the top of the seatback. 3. Connect the tether strap hook (2) to the child restraint hook holder (1) and tighten to secure the seat. o A child can be seriously injured or killed in a collision if the child restraint is not properly anchored. Always follow the child seat manufacturer’s instructions for installation and use. o Never mount more than one child restraint to a single tether anchor or to a single lower anchorage point. The increased load caused by multiple seats may cause the tethers or lower anchorage points to break, causing serious injury or death. 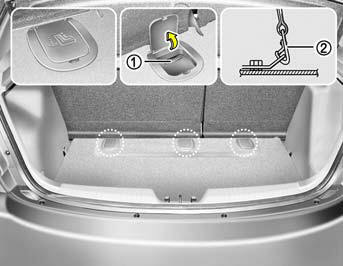 Three child restraint hook holders are located on the rear floor panel. 1. Open the tether anchor cover on the rear floor panel. 2. Route the child restraint seat tether strap over the seatback. 3. Connect the tether strap hook (2) to the child restraint hook holder (1) through the hole on the covering shelf and tighten to secure the seat.